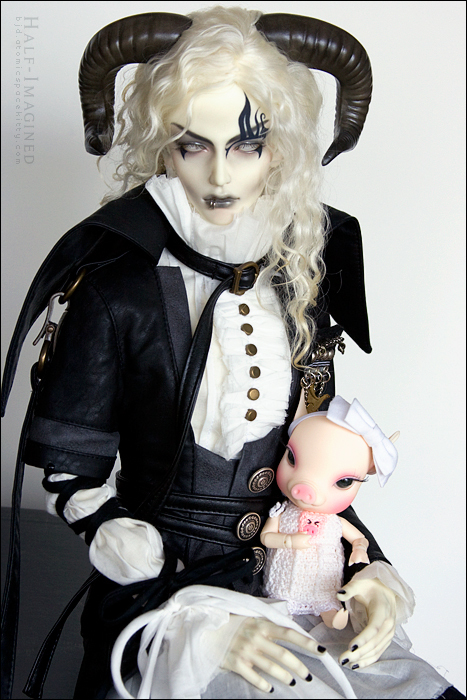 Can you think of a more inappropriate doll to take a picture with cute little Ali (my sister's Alice Cherry Blossom piglet)? Yeah, we couldn't either. We thought the pairing was hilarious! Secretly, Thane has a soft-spot for little Ali but he'll vehemently deny it if questioned. Demons have a rep to protect, you know. 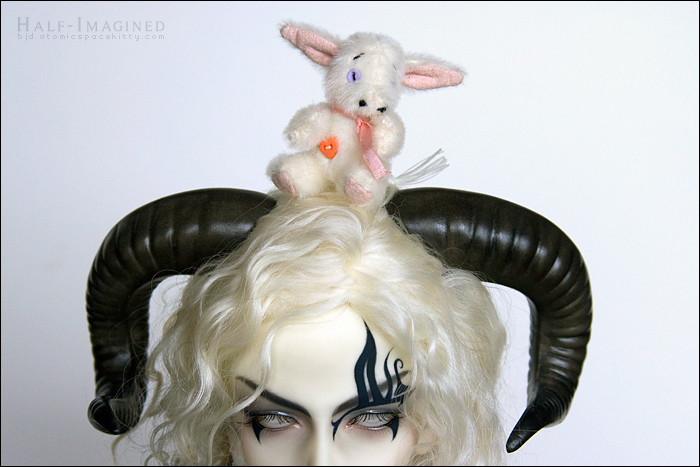 Snoink had so much fun riding McPonysons, he decided to see what riding a demon would be like (although I think Snoink thought Thane's horns meant he was a ram or something equally benign). Can you sense Thane's barely reined hostility? Poor Snoink looks a little nervous. OMG! It's so much fun to torture Thane with cuteness! I think he might kill me now though. Snoink is cuteness plus. I think Thane is just trying to look tough. He really liked Snoink. That's what I think. You may be right. His demonhood has already been called into question by liking Ali though so he has to keep his interest in Snoink under wraps. Yeah, He's really a teddy bear inside. But don't tell him that. @Aunt Cher: Well, he's definitely a teddy bear around cute things but, yeah, I'd never dare bring that up with him. I value my life too much. @Indigo: heehee Thank you! I had fun with these pictures. How could Thayne not like Snoik or Ali they are cutness all over!!!!! !